Here's a place to share and exchange finishing techniques. I have been weathering my trucks and wheels with acrylic paint markers. I use dark brown or brown with 2mm tips. They are also good for painting structures, rails and ties. The GP15 is one I've finally finished adding bits to with lift rings, MU cables, uncoupling levers and ariel. The stock are from two extreme ages, the railbox car I bought a few weeks ago and it was weathered, new wheels and couplings fitted before it touched the rails. 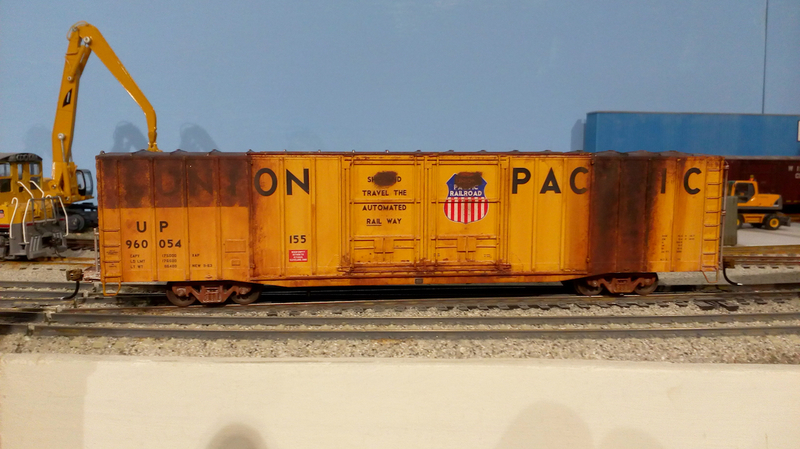 On a photo of these cars I saw one with a new roof panel, so did the same here, masking it while the weathering was added. The UP car is one of the first I bought, over 35 years ago! 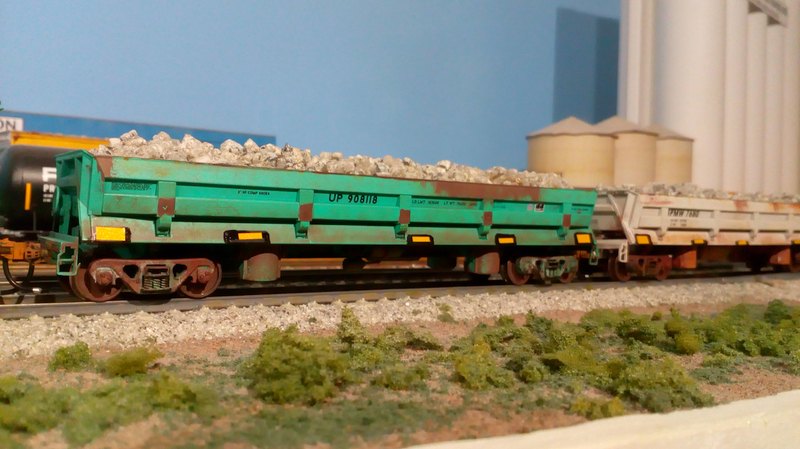 It had some weathering done many years ago, but has been experimented on, it was first to be a slider cleaning car, more weathering and now has new Athearn trucks which I've used a carbon paint pen to put a track across the axle for block detection. I'll see how it goes before doing others. If successful I can then do some other Genesis cars whose wheels cannot easily be changed for metal axled ones. All the weathering was done with thin acrylic washes or paint pens. The weathering and the new panel look really adds character to the rolling stock - when you're able to get results like that I can understand the merits for doing so rather than leaving them pristine and pretending there's a good cleaning plant on the layout!! Have been looking for paint pens with a fine tip - will give them a try out for my N scale railsides and timbers - nothing ventured nothing gained!! Two cars again weathered with acrylic paint pens and washes. Both were done from photos. A DIFCO side dump car. The black patches under the stripes look like they were brush painted so are this rough. The photo I used was was taken in 2006, when the car would have been over 40 years old. Looks like the number area was repainted and then the remaining rust above washed down. I presume it looked like the right end before. I use a stipple brush to apply the rust, with three shades of brown, using the pens to put dots of paint and then using the brush to stipple around the area. The roof is just as rusty! Some authentic looking cars you have there, did you use any Dullcote (or suchlike) before and after using the pens or does the acrylic stay put once dry? Once dry the acrylics do not come off, make sure they are where you want them! The markers dry in seconds, you have to be quick to remove them. I do small patches at a time. The washes take longer to dry maybe 1/2 hour to fully dry. I usually do a white wash first to fade the car, then I do the rust, dirt etc. followed by a black wash in corners. I may wash the marker rust with a thinner mix to wash it down the car. My thinner is 50% blue screen wash and water. I may repeat some stages to get what I want. Most of my cars have little weathering, a bit of a fade and some dirt, most real cars are in good condition, except those side dump cars! See the photo of the hopper. I like the markers because they are quick, oils would take days to dry, I normally take an hour or so from start to finish.